How are you all? I hope your week is going well. I'm looking forward to the weekend when I have my first Saturday free since November. There is a 3 week break between the Farmers Markets so I will actually maybe have time to go to the library and do some of the things Saturdays are for. We are also looking forward to the Easter holiday when we will see my family. This week between helping with the farm, I've been working on building up a kiln load of pottery, plates, and bowls to fire. I have never written about making pottery here on the blog. That is because I haven't done it since before Julia was born! Last fall, I started to dig out my old bisqueware and earthenware blanks that have been stored in our dirt basement. Many kiln loads later, I have begun decorating them with underglazes. I'm still working out the kinks and have a ways to go. It is really fun to be painting and decorating ceramics again - playing with patterns and colors. This summer I hope to get my wheel spinning again in one of our little sheds - once I clean it out. I must say I do feel a bit pigeonholed as to what and who people think I am. I know many of you come here for the knitting but frankly that has been a bit sparse lately. I've been much more into the decorative aspects of Crewel Embroidery and in secret, my ceramics. Time to bring that out of the closet! I have always been an artist who has worked in many disciplines - knitting, crochet, sewing, embroidery, painting, pottery, photography, cooking..... I guess you could call it Art ADHD with the common theme of color. But for my career, I have been mostly known for my knitting and yarn since that is where my longtime paid job was and the focus of most of my books. I'm going to have to work very hard to get out of the pigeonhole and I do not know if it is even possible. It will be a steep, long climb I fear. Lately, I have mostly been in book launch mode - as if you didn't know if you are a regular blog reader! As with any period of time when a book launches - like Crafting a Colorful Home did in January - any author has to put a huge amount of work and time and effort into promoting their book. Over the last few weeks, I have been reaching out to editors, hoping I can secure some more press for the book. Although my publisher has a publicist that is doing the same, I feel, as an author, that I too have to give it a go at generating more enthusiasm and interest in the book that I worked so hard on. And I am very realistic -- I know that any publisher has to support their newest book and that after the initial launch, they turn their attention to the next title. It is a hard reality to swallow as an author but it is the truth. So here is where you all could help. 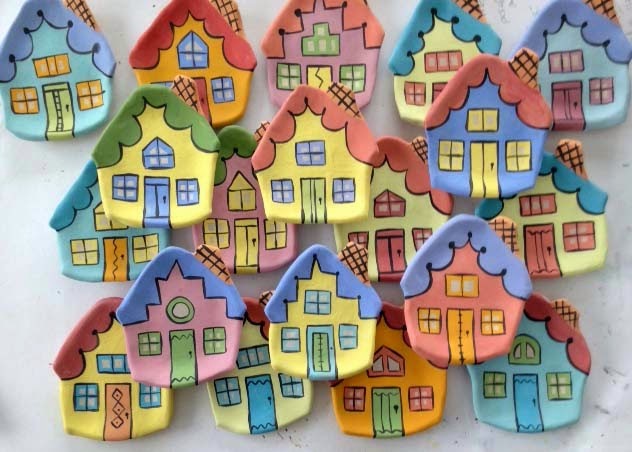 Did you buy or see Crafting A Colorful Home? Did you like it? Would you tell a friend about it for me? If you borrowed it from your library, maybe you could recommend it to fellow library goers? And if you have the time and like to write, a few more reviews on Amazon would be great. Although I have been so happy to have shipped as many books as I have, it would be nice if there were a few more comments on Amazon to generate a bit of on-line excitement. In the general scheme of things, that is where books are sold now. That's it for today. I hope your week is going well. I hope I can finish enough work to fill up the kiln this week or next. I'll keep you posted. I love Pottery! Although, I haven't done any since High School. But I do have a "thing" for "acquiring" pieces at yard sales... [checkout my "yard sale" board on Pinterest some time] As well as Glass... Of course, it could just be in my Genes, Dad's "People" are from Derby and Staffordshire, the heart of Pottery places in England! You can add me to THAT "club"! - Or as my Mother [who grew up in Mass. - must be something in the "water"..?] refers to Us: "Crafter-HOARDERS"! you are one of the most inspiring people that I know through the internet! I'm not surprised to see you enjoying any decorative art. Your color sense is the unifying theme! Please do share some of your non-knitting projects on the blog - I know I won't be the only one who loves to see whatever you turn your hand to. I love all of your work! You are so talented. 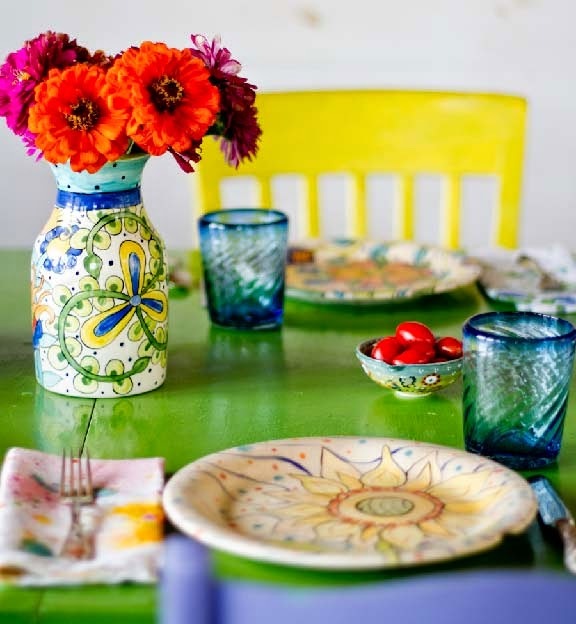 Your "Crafting A Colorful Home" book is fabulous and inspires me every day. Are the little houses to put tea bags on? Have you thought of creating some colorful yarn bowls? I need at least one. Me encanta como pones juntos colores y diseños. I am in the same club, ART ADHD!!! Thanks for sharing your wonderful world and talent. I suspected there maybe more color inspirations in your life other than knitting and sewing. Glad to see I am not the only one who has Art ADD. I believe, in my case, its about using color. Keep sharing your secrets with us. 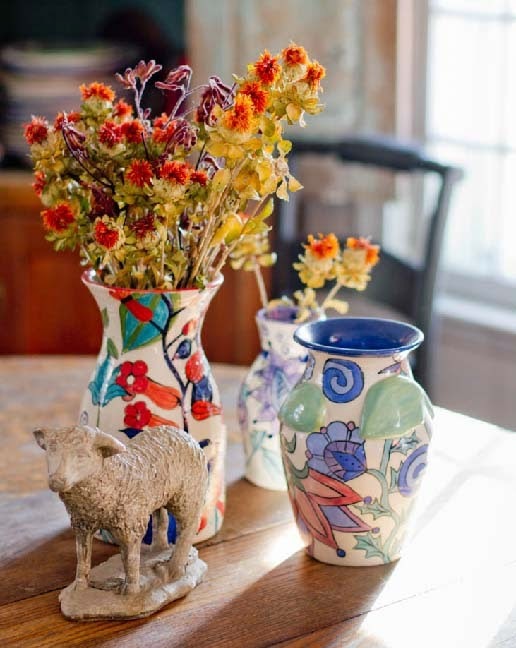 Thanks so much for sharing an old love of pottery making with us. Love all the colours!! Colour adds the to spice of life!! One of my knitting friends and I have been meeting at the ceramics studio every Thursday morning through this winter. I don't really have an artistic bone in my body, but I have been having allot of fun with some of the glazes that have crystals in them and just painting tableware, vases, and ornaments for my tiny garden---the last thing I painted was a big worm. Yarn bowls are my specialty! I love your blog. I enjoy seeing your wonderful animals, your colorful home and your crafts. I bought your latest book and I think it's great. I've looked at it over and over. You have so much energy and a zest for life! Thank you for your blog!